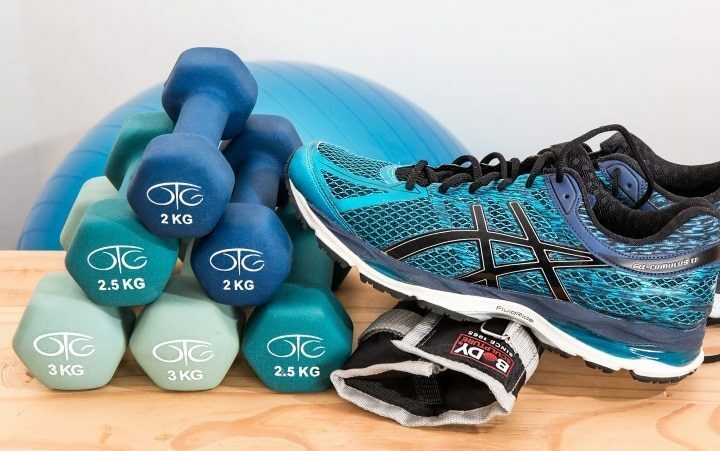 For shoes for gym or exercises, a general term used is either sneakers or sports shoes as few know there is a difference between walking and running shoes. Well, there are. Some years earlier, at least before 1986, there wasn’t much awareness about the need for different shoes for walking and running. Today, the science of orthopaedics has advanced and it has advocated the need for the right shoes for walking and running so as to prevent injuries and to avoid musculoskeletal discomfort. The pressure on feet is different while walking and running. Thus, you need a shoe that will facilitate this pressure in a positive way. Also, you do not notice but the different parts of your foot behave differently while walking and running. Thus, not all shoes facilitate the process as the custom shoes made for the single purpose of either walking or running. There are no shoes yet made which is ideal for both. Hence buying separate shoes are your best and only choice. The arch type is different in different people. If wrong and uncomfortable shoes are used, there can be foot pain and other musculoskeletal pain in the long run. Always wear shoes that are scientifically created for walking and running. Hence it is best to buy shoes that are designated for the purpose, even though if you have shed few dollars more. Your foot is a very important part of your body considering it supports the whole body. While walking more or running, there is severe pressure on the foot and if you are to walk and run without proper shoes, the pressure will be much more, which your feet may not be able to take. The result will be foot pain, injuries and other problems, some of which may be irreversible. That is why, even doctors emphasize on the importance of right footwear. 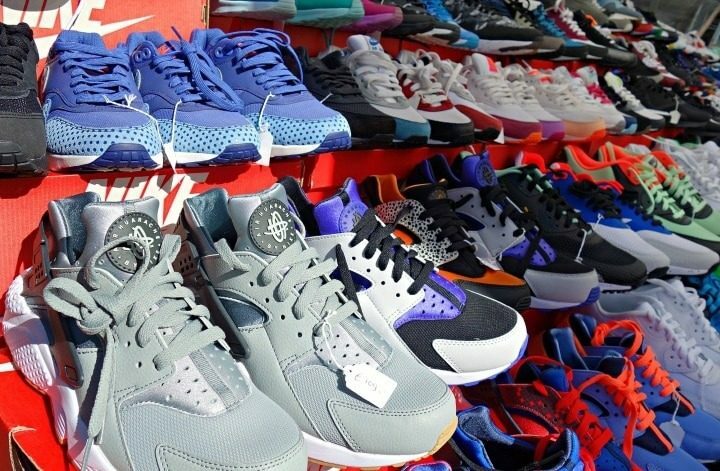 There are many people who may just buy tennis shoes or sneakers for all their outdoor activities, be it for gym, for jogging, for walking or even for casual outings. This is a wrong practice and can be hard on your foot. Please note that there are several differences between a running shoe and a walking shoe. Know what the different features are and buy the right shoe. Though for a layman, it is difficult to find out the difference between walking and running shoes, there are certain features that will help you find if the shoes you are holding are better for running or for walking. Cushion: The pressure that feet exert on the ground while walking is lesser than while running. The number of times the walkers impact the ground is around one and half times their body weight, but for runners, it is thrice. So, runners need more cushion in their shoes. More cushioning will also mean heavier shoes. For walkers, lighter shoes are preferred but with enough cushioning. The Heels: Different people have different running styles. The parts of the foot that strike the ground varies from individual to individual. It can be the front heel, the foot ball or the mid-foot, but for walkers, it is the heel with which they strike the ground. Thus, for walkers, shoes with heel drop or the ones that have the same height from the toe to the heels are the best. This height is displayed on the shoe information in mm. So, shoes with a heel drop that is lesser than 8 mm are the best walking shoes. For runners who strike the ground with their middle foot or the heel should opt for ones that have built-up heels. Another feature in heels is the flare of the heels. Walkers should go for shoes without heel flare while runners need a flared heel for extra support while running. These shoes lend best stability for runners. This feature prevents runners from rolling their ankles. If walkers use flared heels, then it can cause lot of discomfort to them while walking. 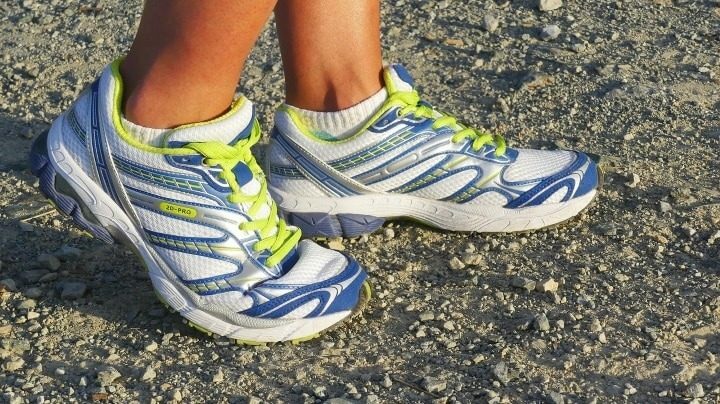 Flexibility: This is one feature that is common to both walking as well as running shoes. You can check how flexible the shoes are. Press down the shoe on the toe and see the area where you can see the bend. Running shoes should bend at the middle of the foot or at front of the foot. Walking shoes should bend at the forefoot but ones that bend at arch should be avoided. Shoes that do not bend at all are unsuitable for both walking as well as running. Soles: Walking shoes come with a flexible sole so that they can stride naturally or walk with the natural gait but running shoes have a stiff sole as they have thick wedges and heels. Motion Control: For those who require motion control will have to forego some of the shoe flexibility. Runners need shoes that allow the foot to be in a neutral position while running but such shoes providing motion control may be some what stiff. Such shoes may not suit every runner. So, choose after due checks. Walking shoes generally do not lend much motion control though. When you buy walking shoes, do not think they are just for your fitness walks but they can be useful for all your chores as well. Wearing comfortable shoes that facilitate walking means you can wear them to your grocery store, for your mall shopping or when you go for a casual evening walk with friends. The Nature of Walking: Or rather look at the places where you go walking, be on a park, a stone path or difficult treks. Accordingly, choose shoes. The more difficult the path is, the stronger the shoes have to be. Flexibility: The more flexible the shoe, the better for walking. You can test the flexibility of the shoes by twisting the shoe from the toe to the heel. There should be moderate resistance for walking shoes. Find where the shoe bends. The walking shoe should bend under the foot ball. Cushions: Walking shoes do not require much cushion. The cushioning is required for the foot, under the ball though. Weight: For walking, lightweight shoes are preferable. Waterproof: This feature is needed as per the use of the shoes. If you are the one who does not venture out much during bad weather, then you probably do not need waterproof liners on your walking shoes. But for those travelling to rainy places or living in places that has wet climate, then waterproof shoes are necessary. The Right Fit: The right fit means zero injuries and more comfort movements. Try the shoes on before walking. Please note that shoes tend to expand with use. If your toes can touch the front part of the shoes, then it is not the right fit for you. Walk on a slant to test it though. Then try wearing it on stairs and if the heels lift off much, then opt for a different pair. The Size: Determine which size is better for you by evaluating the length and breadth of the shoes. Check if there is some space, that of your thumb’s width between the longest toe and the front part of the shoe. Your toes should be able to rotate freely. The shoes should have enough width as well so that your foot can move comfortably on the both sides. Heel Position: The heel should feel comfortable but it should not feel tight. The shoe should allow some heel movement though. Flexibility of The Shoe: When you hold the heel of the shoe and press the toe tip into the ground, the shoe should bend at the foot flexes. This is the right running shoe. If the shoe does not bend well or bend at other areas, then running in such shoes may lead to many feet issues including Achilles tendon or arch pain. In brief, there is a vast difference between running and walking shoes. At the most, you may be able to walk in running shoes but you should never run in walking shoes. 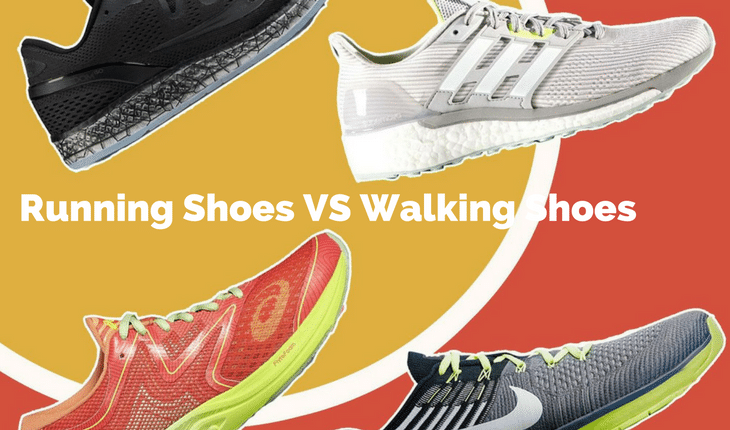 If you are both a walker as well as a runner, it makes only sense to get two different types of shoes. Now you may see it as extra expense, but in the long run, you will be grateful for using two different shoes. While buying, also look at the design and color as well and of course, the price. Good walking and running shoes tend to be expensive but that is because they are created scientifically. An important point to note is that always buy shoes in the evening as that is when your feet is at their most normal size. Though there is quite a difference between walking and running shoes, they both serve hard to serve your feet right.